Although similar in appearance to conventional poured rubber surfaces, Rubber Bond is actually a patent pending breakthrough concept in solid play surfaces. Rubber Bond surfaces are created by spreading a thick layer of loose Playsafer Rubber Mulch and then applying an additional layer of rubber combined with a high quality polyurethane bond. 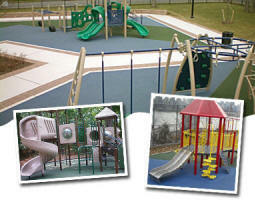 The surface thus has all the shock absorbency of Playsafer Rubber Mulch, plus an additional layer of protection. Rubber Bond's unitary surface provides a neat look with minimal maintenance while offering unrivaled safety performance.